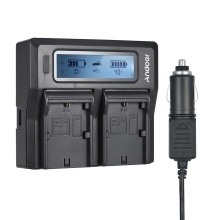 Andoer battery charger has dual battery channels for you to charge 2pcs NP-FZ100 battery at the same time. The LCD display shows battery charging status clearing. It can effectively protect your battery away from overcharge, which largely prolongs battery life. Dual channels, can charge 2pcs battery at the same time, highly efficient! Battery plate type: NP-FZ100. Nice accessories for Sony A7III/A9/A7RIII/A7SIII & etc cameras that powered by FZ100 battery. Wide voltage compatibility, can charge 8.4/12.6/16.8V li-ion battery of any capacity. You can select high/low current charging modes. With CC/CV charging modes and AC/DC/USB ports. LCD display show battery power level and charging status. Intelligent charging control, automatically identify battery voltage and prevent overcharge. With pre-charge and lithium battery 0V activation function, can effectively prolong battery life. Item Size: 12.2 * 11 * 3cm / 4.8 * 4.3 * 1.2"
Package Size: 17.8 * 12 * 4.8cm / 7 * 4.7 * 1.9"